Is your Nikon camera giving you hard time while taking pictures? The problem can be of either lens, battery, shutter, memory cards, camera parts or the software. Read on to know how to troubleshoot camera problems with these easy fixes. Working with a faulty camera could be frustrating. Cameras are extremely fragile. Particularly if you have dropped it accidentally or spilled a liquid or placed the camera at a dusty place, it will trouble you with issues like blurred photos, poor display, inappropriate focus, etc. But do not worry, try the below ways of common troubleshooting camera problems to get back the best out of your camera. Is the battery is charged? Completely charge the battery and then turn on the Nikon camera. Is the battery properly inserted? Ensure the battery is placed correctly in the compartment with positive mark matching the positive. Is the battery compartment clean? Make sure the compartment is free of dust and corrosion. If there is corroded residue in the compartment, clean it using a cotton swab moistened in vinegar. Then take a fresh swab, dipped in water to wipe off the vinegar deposit. Dry the compartment with a clean cotton swab and then place the new batteries. If all the above checks are done and corrected, but the Nikon camera still does not turn on, a battery replacement is a solution. Recharge the Nikon’s Lithium ion battery as soon as it turns low, do not wait for it to fully discharge. Never keep the low battery camera for longer time as this may fully discharge the battery making it unusable. Solution: Make sure your Nikon camera’s monitor button is turned on. The other reason could be the camera is in power saving mode due to which the LCD screen turns blank if it is not used for some time. Turn off the power saving mode of your camera or increase the turnaround time for the camera to enter into power saving mode. 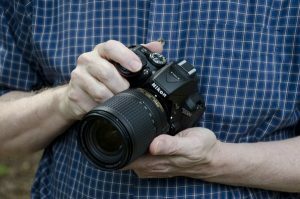 Solution: Suddenly while working, your Nikon camera gets locked-up or freezed, means it does not respond to any activity of buttons. In such a situation remove the battery and memory card for few minutes and switch on the camera again. The camera would return to normal functioning. Sometimes, a slow or incompatible memory card could be another reason for a freezed camera. Use a compatible and approved memory card for your Nikon camera model. If such error messages pop-ups, do not worry or think you have lost your files. A simple troubleshooting of this camera problem is to take out your SD card from the camera, connect it to your computer drive via a card reader, view the files in the drive, and delete the ones which are not of images or videos. Now, insert the SD card in your Nikon camera, it should work. If by mistake, you delete your photos or videos from the SD card, you can use the best camera photo recovery tool Stellar Photo Recovery to recover the lost photos and videos. Recharge the Nikon’s Lithium ion battery as soon as it turns low, do not wait for it to fully discharge.Never keep the low battery camera for longer time as this may fully discharge the battery making it unusable. Selector dial is not in photo recording mode. It is either on a playback or a video recording mode. Change it. The battery is not enough to shoot photos. Charge the battery. Memory card or internal memory is full. To resolve this first transfer the photos to your computer, format the card using Nikon’s in-camera option and now take pictures. Clean the lens carefully with a microfiber cloth. Check the auto focus switch is at right position and the manual focus is not on. While taking a shot, keep your camera steady. Also, you can increase the shutter speed to avoid blurry pictures. Try to fix your camera issues using these effective tips for troubleshooting camera problems. If you have more such troubleshooting tips, do share with us in a comment box below. Remember, in case of other major issues that need camera repair or replacement, always contact Nikon’s authorized service center or customer support for help.